Hard-boiled eggs make a great snack or addition to salads, sandwiches, or wraps. 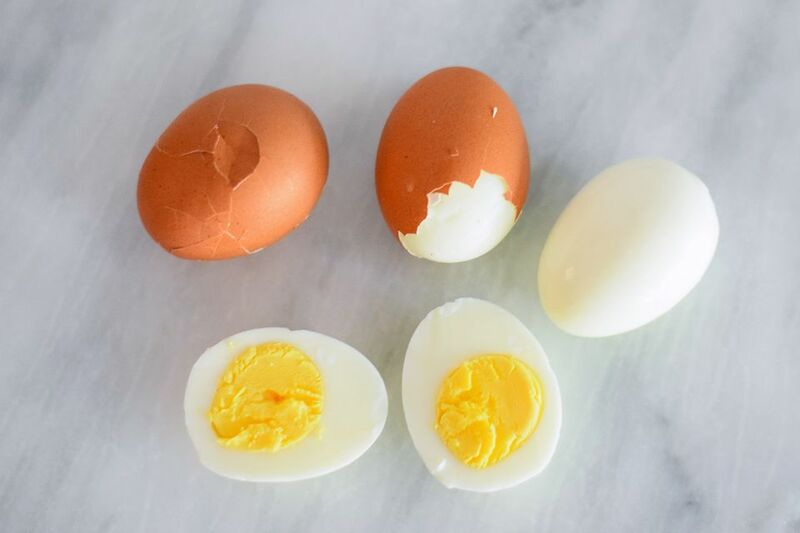 Although boiling an egg may seem simple, precise timing is needed to yield a perfectly hard-boiled egg with no cracks or unsightly green yolks. Cooking eggs in batches will save time and effort. Hard-boiled eggs can be stored in the refrigerator, unpeeled, for up to a week. Cook only as many eggs as you plan to eat within one week. Choose the size of your pot based on how many eggs you will be cooking. For even heating, the eggs should be placed in a single layer on the bottom of the pot; do not stack the eggs. The pot must also be able to hold enough water to more than cover the eggs. Because most people do not keep their eggs on the counter at room temperature, these instructions have been tailored to work with refrigerated eggs. Cover the eggs with cold water. To ensure even heating, the water should cover the eggs by at least 1 inch. Placing 1 tablespoon of vinegar in the water will help keep the egg white from spilling out if a shell cracks but may also add a slight flavor. Salt has the same effect but will raise the boiling point of the water, which can lead to overcooking and a green yolk. If the eggs are heated properly, the shells should not crack. Place the pot over medium-high heat, without a lid, and allow it to come to a rolling boil, which is indicated by large, vigorous bubbles. Bringing the pot to a boil without a lid will slow down the heating process and reduce the likelihood of the shells cracking. You may see streams of bubbles coming out of the eggs as they heat. This is caused by the pocket of air at the bottom of each egg, which expands as it's heated. The expanding air will escape through the tiny pores in the egg's shell and appear as a trail or stream of bubbles. If the eggs heat too quickly, the air will expand faster than it can escape and the pressure will cause the shell to crack open. As soon as the pot reaches a full boil, remove it from the heat. After removing the pot from the heat, place a lid on top and let it sit undisturbed. This is where your timing needs to be precise. If the eggs sit in the hot water too long, they will overcook and end up with a green yolk. Extra large eggs will need 18 minutes to fully cook, large eggs need 15 minutes, and medium eggs need 12 minutes. Set a timer to prevent over or undercooking. For soft-boiled eggs (runny yolks, solid whites), let the eggs sit for 5 minutes less than the time needed to hard-cook the egg. When the timer goes off, carefully remove the eggs from the pot with a spoon and place them into a bowl full of ice and water. The ice bath will cool the eggs quickly and stop the cooking process. The ice water will also cause the egg to contract and pull away from the shell, which will make it easier to peel. Let the eggs sit in the ice bath for at least 5 minutes. If you live in a climate where tap water runs very cold, you can run cold water over the eggs for 5 minutes rather than preparing an ice bath. To peel the egg, lightly tap it on a hard surface to crack the shell. Once the shell is cracked all the way around, it should easily peel away from the egg. After the shell is removed, briefly rinse the egg under water to remove any small bits of shell that may still be attached. Any eggs that you do not plan to eat immediately should be left unpeeled and refrigerated. Unpeeled hard-boiled eggs will stay good in the refrigerator for up to a week.